At Delta Rigging and Tools, Inc., we stock Straightpoint® digital load cells for monitoring the tension of a loads. Straightpoint® products have over 30 years of excellence in manufacturing dynamometer tension load cells. Straightpoint® continues to lead in innovation by launching the first worldwide off-the-shelf wireless centre of gravity system and is the first load cell manufacturer to incorporate RFID tags in all its ‘link’ load cells as standard. Current developments include an ATEX approved wireless dynamometer and range of running line dynamometers. Click on the images below for product specifications and more information. 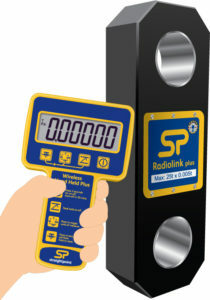 A wireless tension load cell capable of both weighing and dynamic load monitoring load sense, the latest Radiolink plus is constructed of high-quality aircraft grade aluminium and features an advanced internal design structure. This internal design structure not only provides the product with an unrivaled strength to weight ratio but it also allows the use of a separate internal sealed enclosure providing the load cell's electronic components with IP67/NEMA6 environmental protection even with the battery cover plate missing, making this industry leading dynamometer even more suitable for use in the harshest environments. 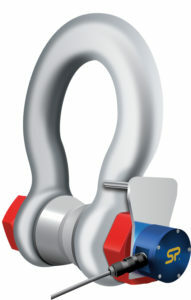 Straightpoint’s Wireless Loadshackle provides the perfect solution to limited headroom applications. Each Wireless Loadshackle is proof tested, then equipped with a hard anodized aluminium electronics enclosure. Data is transmitted utilizing the latest in wireless technology providing safe, high integrity, error free transmission of both static weight and dynamic load to a wireless handheld controller or wireless Windows PC data logging software package. 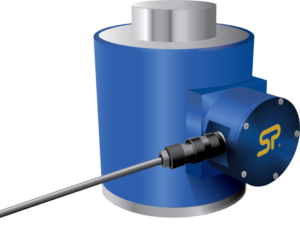 Manufactured in ranges from 5t to 500t - Straightpoint compression load cells are available in wired and wireless models. The bodies are machined from high grade stainless steel, offering excellent strength and anti-corrosion properties. The compact lightweight design provides ease of use and superior portability, allowing Straightpoint compression load cells to be used in a broad range of industries including mining, energy, defense, heavy rigging, shipping, and general transportation sectors. Straightpoint's Jumboweigher Crane Scale is a popular choice among steel service centers and other heavy industrial applications for under-hook crane weighing. The Jumboweigher is remote controlled, cost effective solution for those who are looking for an affordable, heavy duty, permanent use crane scale. The Straightpoint COLT is a lightweight tension meter for fast and accurate measurement of wire rope tensions up to 11,000lbf / 5000 kgf and up to 1” / 25mm diameter. Manufactured using an integral, high accuracy, Bluetooth module the COLT transmits load data wirelessly to any smart device running our Android or iOS app. As the library of wire rope diameters and constructions is increased each app user will benefit when they update and receive any new data. Constructed from aerospace grade aluminium the COLT digital tensionmeter is lightweight and easy to handle and operates on wires that are already under tension. 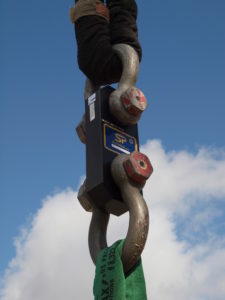 Once in place it allows the operator to quickly check tension on cables or wire ropes set at any angle. A built in smart device holder allows the COLT to be used as a traditional tension meter with on board display or the smartphone maybe handheld or mounted elsewhere. Supplied in a purpose made carry case the COLT is portable and utilizes standard alkaline batteries making this perfect for on-site cable tension measurement across the world.